At Napier & Napier in Rochester, New York, we practice criminal law, aggressively seeking justice for our clients in the Rochester metropolitan area and throughout the state. We are two brothers whose father founded our law firm in 1948. With more than 65 years of experience and a successful track record, we are proud to carry on his legacy of personalized service and outstanding legal representation. MoreAt Napier & Napier in Rochester, New York, we practice criminal law, aggressively seeking justice for our clients in the Rochester metropolitan area and throughout the state. We are two brothers whose father founded our law firm in 1948. With more than 65 years of experience and a successful track record, we are proud to carry on his legacy of personalized service and outstanding legal representation. • Drug crimes: marijuana, cocaine, ecstasy, etc. Robert A. Napier joined our law firm in 1983 after earning his Juris Doctor from Southwestern Law School in Los Angeles. In addition to practicing criminal law, he also represents clients in personal injury and products liability lawsuits, as well as insurance and real estate matters. James A. Napier joined our firm in 1987 after earning his Juris Doctor from Georgetown University Law Center in Washington, D.C. He is licensed to practice in all state courts and before the U.S. District Court for the Western District of New York and the U.S. Court of Appeals for the 2nd Circuit. 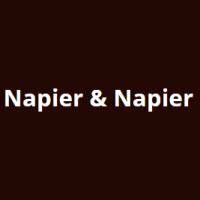 Napier & Napier offers free initial consultations. We also accept all major credit cards for our clients' convenience.